From Oct. 9th to 13th, the General Manager, Sales Managers and General Engineer from Beston Group will visit customers in Malaysia. They will arrive there on Oct. 8th. Welcome to contact us to make an appointment, if you are interested in our products, including paper egg tray machine, automated waste segregation system, carbonizer machine and waste pyrolysis equipment. 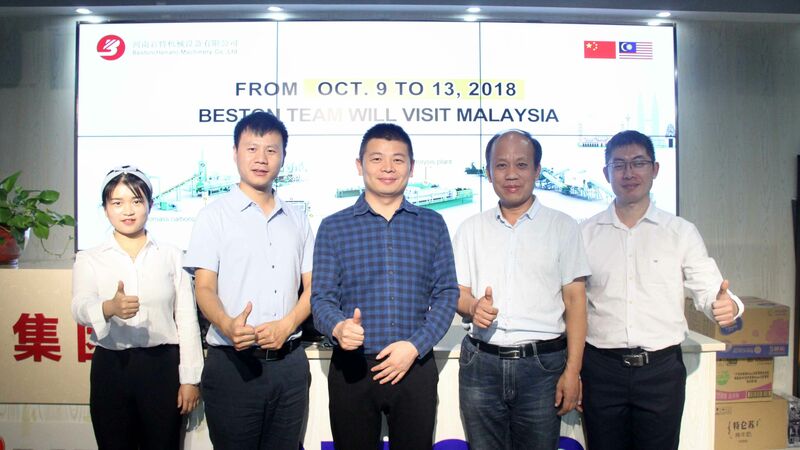 As mentioned, the team to Malaysia is composed of the general manager and engineer, as well as experienced sales managers. We can expect that the powerful team will provide Malaysian customers with the most cost-effective and professional business plan. Hopefully, Beston will make a great difference in the waste recycling industry in Malaysia. If you are in Malaysia and interested in our products, please do not miss the opportunity. According to the recent news, the Malaysian government pays much attention to the environmental protection. For example, the disposable plastic items will be banned by the end of 2030. That’s one reason that why paper egg tray making machine will be a great investment project. Meanwhile, with the influence of “One Belt and One Road” initiative, solid waste treatment becomes urgent and necessary. It will be perfect if we can recycle waste into something useful after waste sorting. While it just so happens that Beston can offer you waste plastic recycling plant, waste tyre recycling plant, as well as biomass pyrolysis plant. Also, we have rich experience to save your time and money. Moreover, upon the policy support, it will be easy and logical to invest in a waste recycling plant. Of course, it is also a profitable business plan, especially when you cooperate with a reliable waste recycling plants manufacturer, such as Beston Machinery. Welcome to contact us!